Among the new additions to the public policy recommendations are calls for the minimum smoking age to be raised to 21 years old. The AAP believes this is a necessary move because many middle school and high school students are first exposed to smoking through cigarettes obtained from an older classmate. A ban is also urged on menthols and other forms of flavored cigarettes, as these are seen as more appealing to children. In order to prevent second-hand exposure, a comprehensive smoking ban on any area a child is likely to be present is also urged. This includes sidewalks, sports facilities, entertainment venues, parks, restaurants, and shopping outlets. Education and legislative efforts are also urged to create smoke-free homes and vehicles. In order to prevent the skirting of taxation, the recommendations also urge that tobacco taxes be collected at the point of production, rather than at the point of sale. The AAP also considers e-cigarettes to be dangerous in their own right due to emissions, as well as being a potential gateway to regular cigarette smoking. In light of this, the group is calling for e-cigarettes to be placed under the same regulations as normal tobacco or nicotine products. This would prevent e-cigarettes from being marketed to children or in venues where children are likely to see them, subject them to increased taxes, and restrict how they can be depicted in media, among other changes. 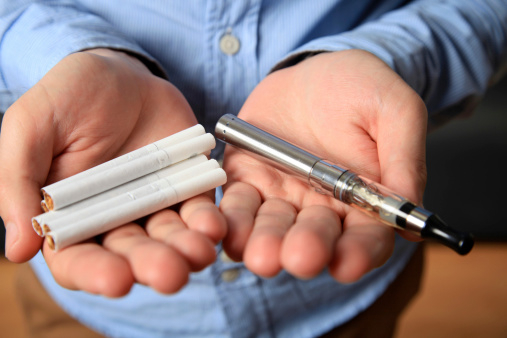 Childproof packaging is also urged for the liquid nicotine products that are used to refill e-cigarettes. Liquid nicotine is highly toxic and even small amounts can make a small child sick. In 2014, there was one toddler death and 3,000 poison control calls regarding liquid nicotine ingestion. Physicians are advised to counsel parents who are caregivers on ways to quit smoking and should offer guidance and counseling on the dangers of smoking to all children before they begin trying it themselves. The AAP does not consider any level of tobacco use to be safe, noting that tobacco is a unique consumer product that can severely injure or kill when used as intended. “Public Policy to Protect Children From Tobacco, Nicotine, and Tobacco Smoke,” Pediatrics 2015, doi:10.1542/peds.2015-3222. “The American Academy of Pediatrics Issues Sweeping Recommendations on Tobacco and E-Cigarettes,” American Academy of Pediatrics web site, October 26, 2015; https://www.aap.org/en-us/about-the-aap/aap-press-room/Pages/Tobacco-and-E-Cigarettes.aspx.